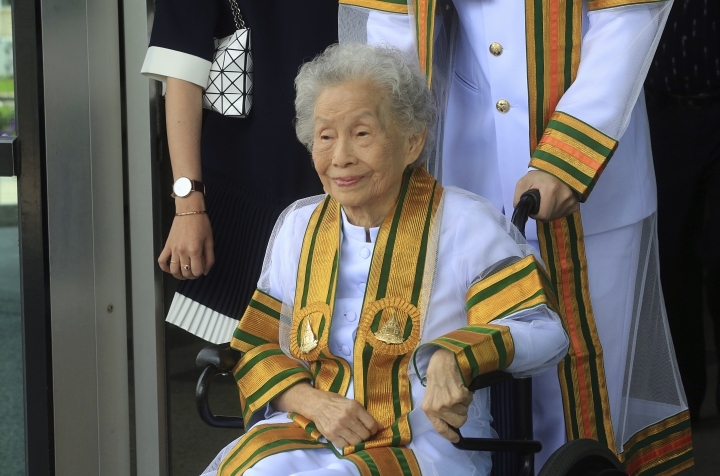 BANGKOK — A 91-year old woman in Thailand has earned a college degree after spending more than 10 years studying for it and has received her diploma from the country's king. Public television broadcaster Thai PBS says Kimlan Jinakul was granted the Bachelor of Arts degree in human and family development Wednesday at the government-run Sukhothai Thammathirat Open University just outside Bangkok. "If we do not study, do not read, do not know, then we won't be able to speak and make sense," she said. Her diploma was handed to her by King Maha Vajiralongkorn Bodindradebayavarangkun, who took the throne last year. Diplomas at Thailand's public universities are traditionally handed out by members of the royal family. "I am happy and honored that the king has graciously shown such limitless mercy," Kimlan said, using a phrase meant to show utmost respect to Thai royalty. Kimlan traveled with her family from their home in Phayao province, 725 kilometers (450 miles) north of Bangkok, to attend the graduation ceremony. "Sometimes she felt weary because of her body," Kimlan's son, Mongkol Jinakul, told Thai PBS. "But we as her children tried to cheer her on and mom studied until the end and it was a success." The Sukhothai Thammathirat Open University, which has courses catering for the elderly, this year had 199 students who are over 60 years old. It offers part-time and remote learning. "For the elderly, we focus on practicality rather than the academic aspect," professor Panumas Kadngaongam, acting dean of the university, said. "So the subject can be studied and put to use immediately."